(From Sigma lens literature) The Sigma Corporation is pleased to announce the new 18-125mm F3.8-5.6 DC OS HSM. High zoom ratio lens designed exclusively for digital SLR cameras and incorporating Sigma's original OS (Optical Stabilizer) function. Compact construction of 88.5mm (3.5") in length and 74mm (2.9") in diameter. Minimum focusing distance of 35cm/13.8 inches and maximum magnification of 1:3.8, making it ideal for close-up photography. *2 If the camera body does not support HSM motor, AF will not work. I was surprised to see some of the negative reviews of this lens, but then realized people were comparing it to "L" lenses. It's not an L lens, but it's been extremely useful to me, and gives a lot of bang for the buck. It's extremely sharp at the long end (rivaling the most expensive zooms around), and not as soft on the wide end as some would have you believe. At the wide end (18-35mm), its level of sharpness would compare to Canon's EF-S 18-55mm "kit lens" which isn't ideal, but still not horrible. There are days when this lens will stay on my camera all day, mostly due to the excellent zoom range -- 18mm is wide enough for just about anything, while 125mm is long enough for most uses. No changing lenses here. Focus: It doesn't have USM or Sigma's "HSM" equivalent, but it's about as fast as you can get without those extra motors. I use the lens for basketball shots (with flash), and it focuses quickly and accurately. Yes, it's loud, but that doesn't mean it's slow. Softness: When using this lens wider than 35mm or so, it's still sharp, but only if your subject is relatively close. Farther away than 10 feet or so, the lens seems to hunt for focus at times, but will take the shot anyway. This accounts for the "softness" at wide angles -- it's actually just the lens being slightly out of focus, in my opinion (because it's really sharp if the subject is up close). Bokeh: At the long end (80-125mm), this lens can produce great bokeh (out-of-focus circles in the background), depending on subject. I purchased this lens last week for my Sony A200 on purpose to replace Sony's old DT3,5-5,6/18-70 kit lens. I perform some tests to compare new lens with my Sony 18-70 and Sony DT 4-5,6/55-200 lenses. Comparing sharpness of Sigma and Sony 18-70 I found Sigma being better by narrow margin in the center and essentially better near the corners. Sigma's sharpness gradually slightly decreases towards the long end but even at 125 mm it remains higher than sharpness of Sony 18-70. Chromatic aberration in 18-50 mm zoom region was higher than I expected. It was less disturbing in 70-100 mm region but noticeable at 125mm again. Comparison of sharpness between Sigma and Sony 55-200 was in favour of Sony. Sony's sharpness both in center and corners was slightly higher at all corresponding focal distances. At 200 mm sharpness of Sony remains little bit better than that of Sigma at 125mm. Conclusions: For my great pleasure replacing the previous kit lens for Sigma 18-125 gives me much better sharpness and expands zoom range almost by factor of 2. This is nice walk around lens for reasonable price that covers 90% of everyday needs. Somewhat high chromatic aberration is obviously the fee for very versatile nature of this lens. Sony DT 4-5,6/55-200 is excellent lens too, due to it's sharpness, convenience and good price and covers all needs for longer focal length. P.S. I perform lens tests by shooting from tripod large sheet of newspaper supplemented with specific pictographs sticked in the center and near the corners of the frame. I evaluate sharpness and chromatic aberration visually. All shoots was taken at aperture 5,6. Purchased this lens for use with a Nikon D60. Have used this lens for about a month. Despite my initial trepidations, am very pleased with the results. Have used this lens so far to shoot both static and action pictures of trains and aircraft. I have found the auto focus to be fast and accurate. So far I am very pleased with the images recorded with this lens. Just got a Rebel XSi a couple of weeks ago after using a Minolta A2 for many years as my intro to digital. I have som older EF Canon and Tamron glass that I used on the Rebel for a couple of weeks to familiarize myself with the camera but never intended to stay with them. The debate was the Canon 17-85 IS or ?. I happened across this lens in the list on this site but there were no reviews around till Pop-Photography ran one on their site and rated this lens above the 17-85. I was a little hesitant because Sigma still has a reputation for spotty quality control but I went fot it anyway. What a surprise. With the grip on the Reble and this lens the package feels solid and perfectly matched. The 18-125 range translates to 29-200 with the APS-C sensor which is almost identical to the 28-200 on the Minolta A2 I was so used to and covers 90% of what the average photographer normally shoots. Focusing is not as fast a a Canon ring USM but fsat enough and smooth with very little noise. The big question was always image quality. Pop-Photog said it was Very Good-Excellent, and it is when you stop down to F8-F16. I shot the first pictures with it yeaterday at a club shoot and to say I am pleased would be an understatement. Just for a lark I pasted a newspaper to my wall and shot some comparisons with my old Canon 20-35mm L series lens. At f8 the Sigma gives up a bit in the corners but is just as sharp in the center. Not bad when you consider the Canon cost $2400 17 years ago. Bottom line - at $399 this lens is a flat out steal. Just like the other person I also decided to take a chance and buy the lens. The lens OS system makes a noise for about 1 min, since it been operating even if you don't focus or use the camera, I am not sure about it using battery for it all this time, that has been discussed in details somewhere else on the net. You can't manual focus while in auto focus mode. I had a problem with the auto focus becoming very slow once, but it resolved it self after taking the lens off the camera and putting it back on. I hope it was a one off, but please tell me if anyone had the same problem. As for the better side I find the HSM focus to be normally very fast. The picture quality is good but not the sharpest, the Sigma 17-70 I had before is sharper. The range is very good, although at 18mm there is strong barrel. As for the OS system I managed to get good photo at speed of 30 on 125mm, anything below it came blurry. So really if you don't try extremely to be steady I would say it is 2 stops down. Beside that the lens is quite small and light for it zoom range, which is very handy. Make your decision. Unfortunately at this range there is not much competition. Maybe just 18-200. I've done pretty extensive tests on this lens, taking many tripod shots out my window in Chicago, trying different apertures and focal lengths, and comparing them to my two Canon lenses, and found it compared favorably. I found the Sigma's photos to be good looking and always in focus. The OS works pretty well, and I was able to take two perfectly clear hand held shots at full 125 mm telephoto at only 1/15 of a second, though I had to use my best technique, as I suspect at full tele it's not hard to overwhelm the OS. Two more identical shots taken without OS were both blurry. At 18mm this lens is a tiny bit less sharp than Canon's well-regarded 18-55mm IS kit lens that came with the camera, but as you zoom in the Sigma gets better, particularly at 50mm. Here is I shot on Flickr taken with this lens at 18 mm. Unfortunately Flickr rezzes the image down a great deal so you can't see it in all its 12 megapixel glory, but this will give you some idea. Canon doesn't yet have a zoom for digital cameras with this same range, and the closest thing they do have, the 17-85mm, is more expensive and didn't perform all that well in slrgear.com's tests. The non-OS version of this Sigma did arguably better than the Canon in those tests, and two and a half years after its predecessor's debut you would hopefully expect this newer version of the Sigma to have at least a few refinements to the IQ, but I have no way of knowing that for sure. The telescoping part of the lens is very tightly constructed, with no looseness or feeling of imprecision at all, unlike the Canon kit lens. It has a zoom lock, but this doesn't seem to be necessary as there is no lens creep. I found this lens to be very well built and solid. This is not a light lens. At about a pound it is twice as heavy as the Canon 18-55mm IS kit lens. 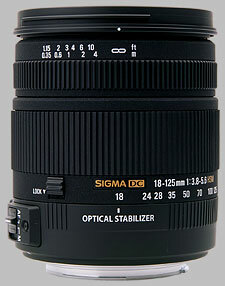 Still, some of the superzoom digital lenses by Sigma and Tamron such as the 18-250mm weigh quite a bit more. Overall I would say this is a very nice lens and I would buy it again. If you want the option to have one lens you can leave on the camera while travelling around, and if you're hooked on wide angle as I am, and if you also like telephoto but don't need a 200 or 250 mm superzoom and all the image quality compromises that can entail, this is the best and only choice for Canon APS-C digital cameras that I know of at this time, and I would recommend it. Update: I would like to add to the other reviewer's comment about the OS staying on for maybe a minute after the shot. This does seem to be a bit of a problem, since all the time it is on it is running down the battery. I don't know why they did this; the stablized kit lens that came with it deactivates seconds after each shot, and the battery seems to last longer with it. But I've discovered an easy workaround for the Sigma, at least with a Canon xSi: Just hit the ISO button, and the OS instantly goes silent, and presumably inactive.